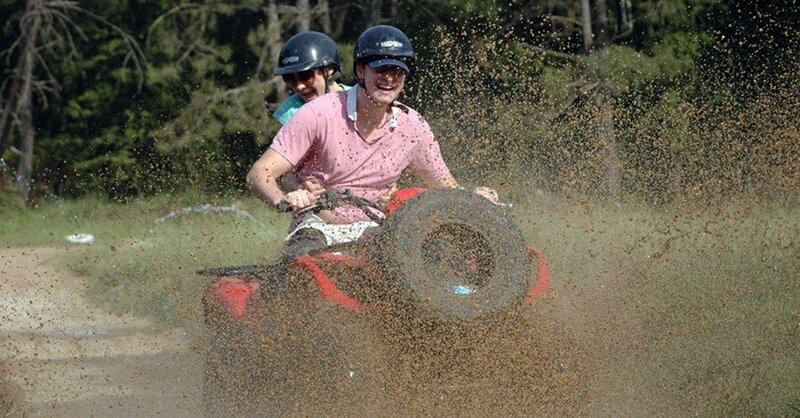 If you’re tired of the traditional vacation tours you’ve been taking, and if you want to change it up this year and do for something new and exciting, our Marmaris Quad Safari tour is just the thing you’ve been looking for. Mesmerizing emerald forests and captivating sunny dunes of Marmaris await you. Hop on your quad bike and wake up your inner child as you bump through the rugged terrains and have fun like never before. Have a thrill of a lifetime as you speed through the slippery sludge and dusty roads of Marmaris. 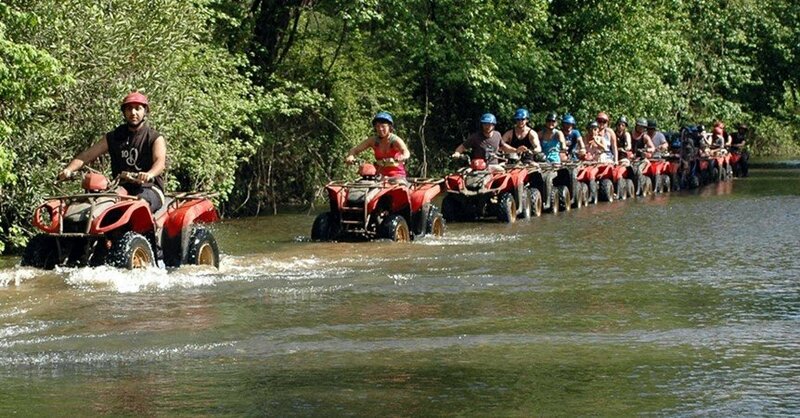 Quad Safari is one of the most popular outdoor activities in Marmaris. 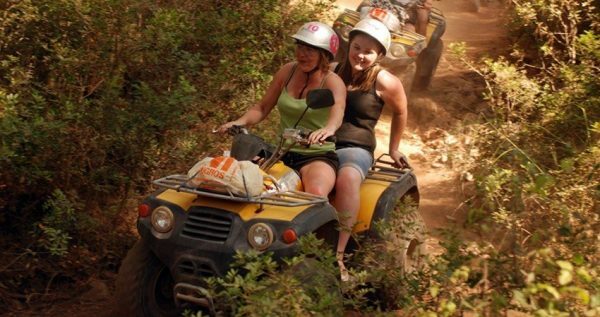 This adventures tour is set up through the mountain areas around Marmaris. You will be able to determine your own pace, as we do realize that some of you are adrenaline junkies and others want to enjoy the nature. Whether you want to drive slow, or get crazy behind the wheel is your own choice. This amazing and thrilling excursion starts with a pick-up service from your hotel in Marmaris. Our drivers will take you for a comfy and serene twenty-minute drive through the green pine forest, where our quad safari facility is. License or previous experience with driving a quad are always useful, but they are not necessary in order to enjoy this amusing activity. 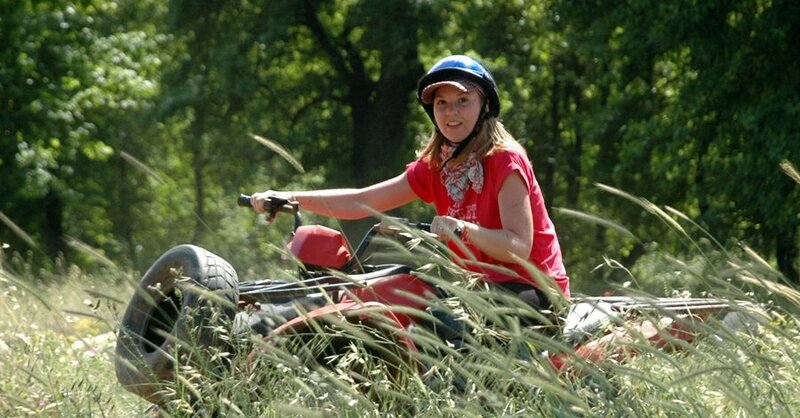 Children can also take part in this unique adventure, but the permission of parents and our instructors is needed. 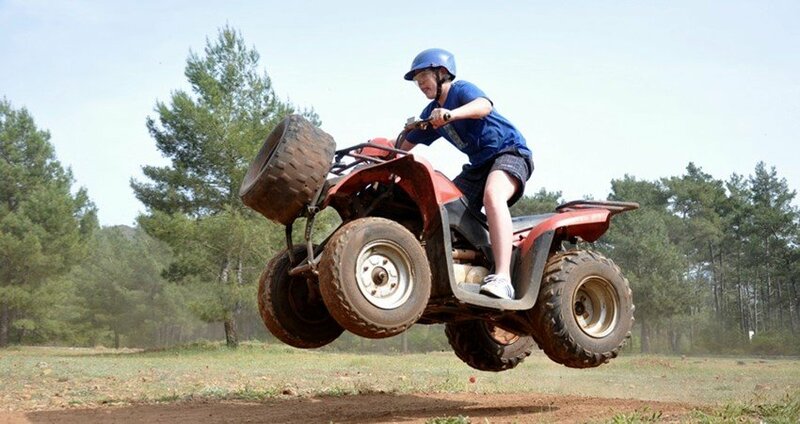 Our Quad Safari trip is approximately three hours long, including the time it takes to pick you up and take you and your friends or family back to the hotel. 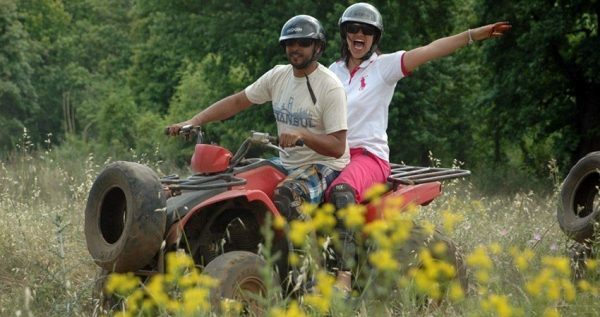 Driving through the fascinating scenery of vibrant wooded areas, breathtaking mountains, and hidden river beds, in quad bikes specially designed for this kind of journey. There will be skilled professionals driving first and last in the line, as always safety comes first. If you’re hungry for some and excitement and you want to explore some new tours on your upcoming vacation call us. Excursion Mania have the best tours, made to please every adventurer out there. Children under 12 can only ride on the same vehicle with their parents. 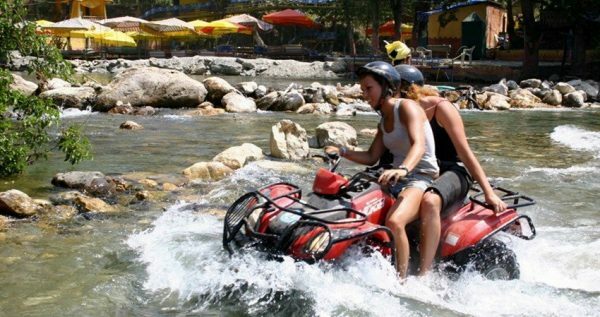 Marmaris Quad Safari Tour is a half-day long adventure meant for those outdoorsy types and adrenaline junkies among you. The tour starts with a free pickup from your accommodations, followed by a short drive to a spot 15 km north of Marmaris, from which our tour begins. Once we arrive to the site, you will be welcomed by our experienced Quad instructors, who will show you some basics about these fun vehicles, as well as some safety rules. This part might sound boring, but it is necessary because your safety is our primary concern. The briefing is followed by demo rides, which will help you get familiar and comfortable with your Quad. 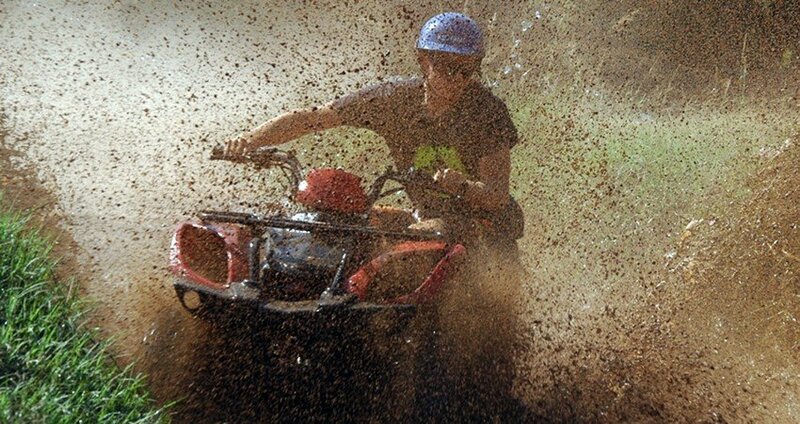 Quad Safari is set through hilly and muddy areas on the outskirts of Marmaris. You will have fun like never before as you speed through riverbeds and bump between trees. This might even sound dangerous to some of you, but you needn’t worry. Our experienced and skilled drivers will be with you all the way, making sure that you are safe and having fun. We should also note, that all of our vehicles are regularly maintained and well equipped. Once our thrilling escapade is over, you will be able to use the showers set up at the finish spot of the tour and change your clothes. Since this tour tends to get muddy and dusty, this refreshment is usually a delight for our guests. We arrange transfers for all of our guests and once our tour is over, our driver will pick you up and drive you back to your hotel in our comfortable and well-kept vehicles. Our hotel transfers are free of any extra charge as they are already included in the tour price.